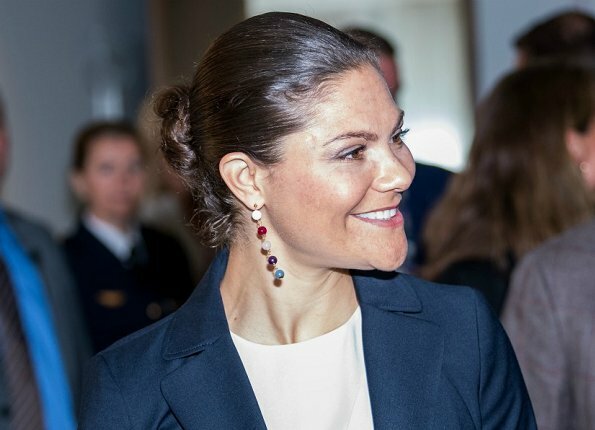 Crown Princess Victoria attended the meeting of Swedish Leadership for Sustainable Development at Sida headquarters on May 18, 2017. The purpose of Swedish International Development Cooperation Agency (Sida) is to create opportunuties in order to improve living conditions for people who live in poverty and are without power. Everybody living in Sweden and paying their taxes contributes to that initiative. Very becoming outfit. I wear exactly the same today. Except the candy earrings and the red accessoires. Good suit, but not great. Love the suit and her professional look. 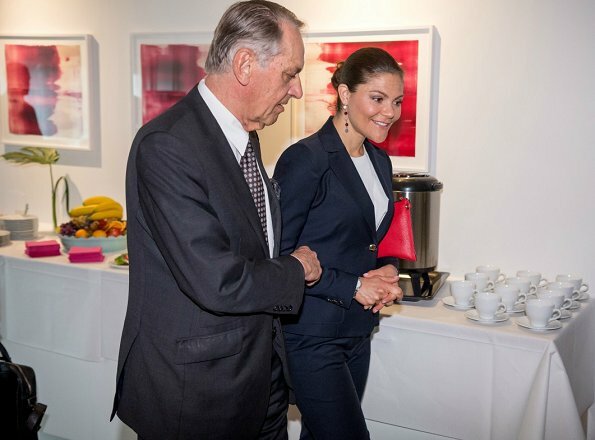 Very appropriate for a Crown Princess. Looks fine but for her bun once again. The suit is simple, stylish and professional - and the pop of colour in the shoes and earrings really lifts it. Fully agree. Perfect business look which suits her very well. Regrettably too masculine look for my taste! This suit looks okay but I would have prefered if she had worn it with colorful top and not bring color with the shoes and bag (she wore red shoes and bag). Her usual hairstyle brings attention to her face and her skin. I've noticed that her usual lines on her forehead seem to have dissapeared. Hmmmm?? This is boring. Nice jacket, but it would be better with interesting blouse, bigger jewelery or a scarf.